​​The 12th ECTN conference with main theme 'Culture and Heritage for Responsible, Innovative and Sustainable Tourism Actions', will discuss the latest trends in the field of culture, heritage and responsible and sustainable tourism, including innovation, creativity and cultural tourism product development. The conference aims to explore major challenges, risks and opportunities for sustainable and responsible tourism development related to culture and heritage assets, as well as suggest practical steps for the development and promotion of cultural tourism products. The theme encompasses all forms of culture, including contemporary cultural expressions and all forms of cultural heritage, as well as natural heritage. Presenters are invited to showcase relevant experience, share their best practices, give detailed examples and provide practical recommendations to preserving, restoring, deploying and promoting culture and heritage values, with innovations for sustainable and responsible tourism development. 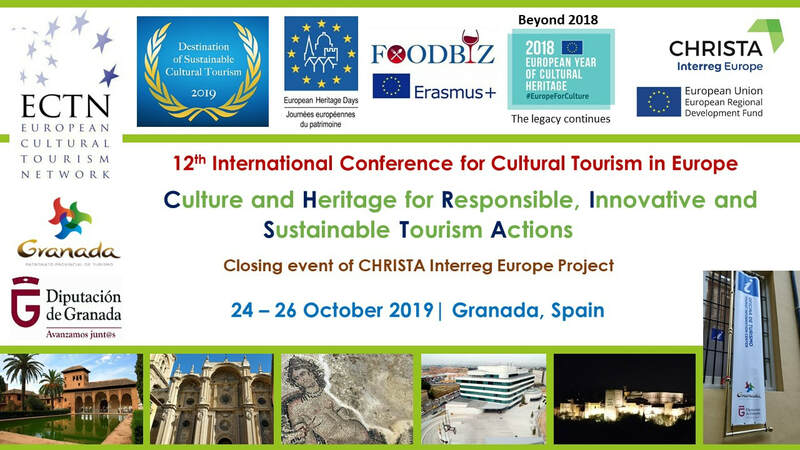 The conference is organised in close cooperation with Granada County Council (Diputacion de Granada), a partner in the Interreg Europe project CHRISTA – Culture and Heritage for Responsible, Innovative and Sustainable Tourism Actions (2016 – 2020). Smart Tourism and Smart Destinations developments incorporating Culture, Heritage and Creativity aspects. Participants, including selected presenters will have to make their own arrangements for travel and accommodation. ECTN cannot cover travel expenses. Abstracts and presentations accepted by the Programme Committee of the Conference may be published online with author's approval. A post-conference study tour in Granada area is being planned and selected presenters will be invited. The Awards ceremony of the ECTN prize for ‘Destination of Sustainable Cultural Tourism 2019’ will take place during the Conference. The 2018 ECTN Awards are in partnership with Europa Nostra, the European Travel Commission and NECSTouR, supported by Iter Vitis Cultural Route of the Council of Europe and FOODBIZ Erasmus+ project led by the University of Macerata. ECTN has been a member of the Stakeholders Committee of 'European Year of Cultural Heritage 2018'. The legacy continues. ECTN is a signatory of the ‘European Tourism Manifesto for Growth & Jobs' and a founding member of the 'European 'Heritage Alliance 3.3'. ECTN cannot cover travel expenses for selected presenters, but delegate fees will be waived for one person per presentation. ECTN is not responsible for arranging visas for delegates or journalists to attend the Conference.